Can you believe it? I'm posting two days in a row! 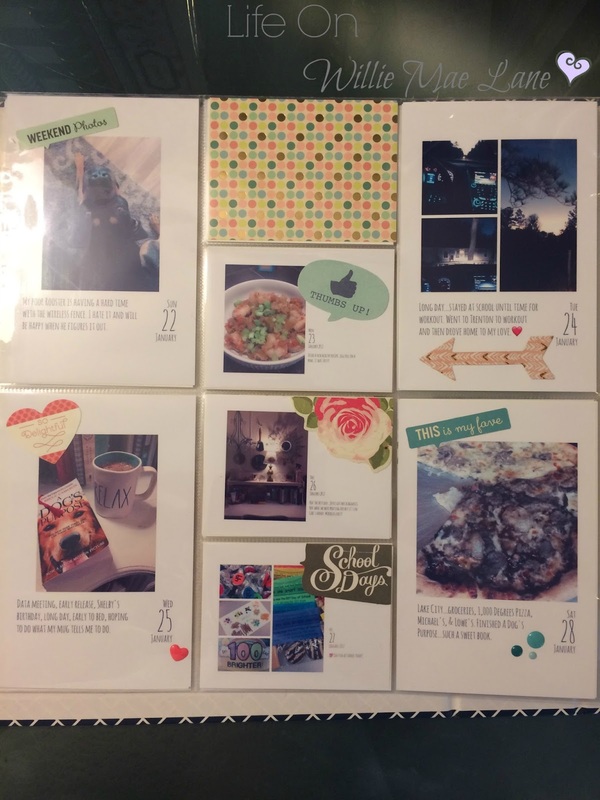 I wanted to share my Project Life album I've been working on this year. It's actually more like Project 365 since I take at least one photo a day and journal a bit about my day. My pages aren't elaborate and I do not have time to journal extensively each day. I would not keep up with this if that's what I had to do. I know myself too well. The process needs to be simple and streamlined for me. 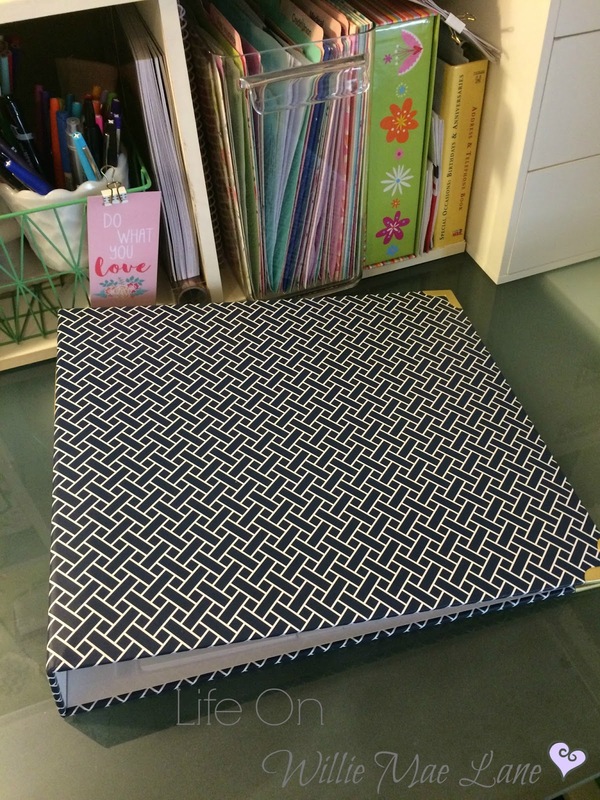 I use an app called Collect which I will share more about at the end of the post. I love this app! 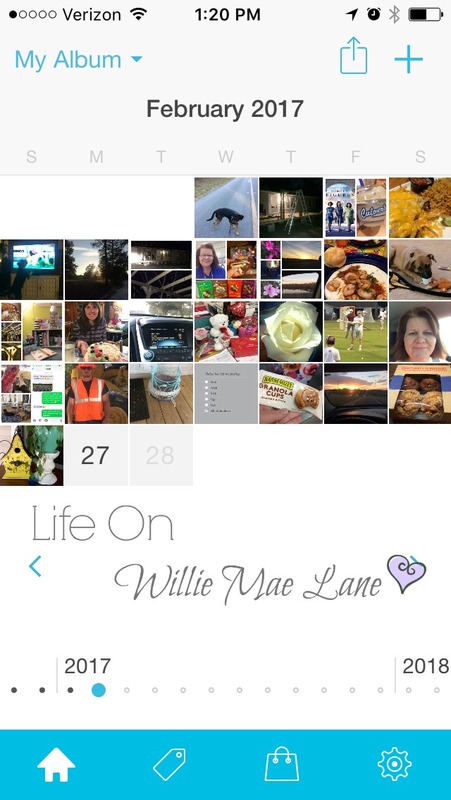 Every night, I open the app and choose a photo or create a collage if I have a few I want to use, and journal a bit about my day. If I forget, I can always do it the next day. I try not to get more than a day behind though so I can remember the highlights of each day for the journaling. 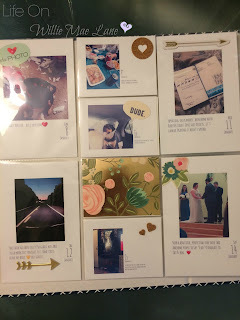 I print my photos that are complete with the date and journaling. You can download the photos in landscape or portrait and in two different sizes. You can also choose different variations of font and layout. I chose a color scheme for the embellishments and the little bits of paper I used. I add at least one embellishment to each photo and sometimes more. This is not everyone's style I know, but it suits me and makes me happy. 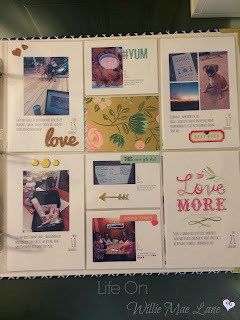 I filled in the last few pockets on this page with a few extra photos from the month. Here are a few close-ups of some of the photos. Every now and then, I forget to take a picture or just don't have one I want to use, and I just use a graphic or quote or something for that day. 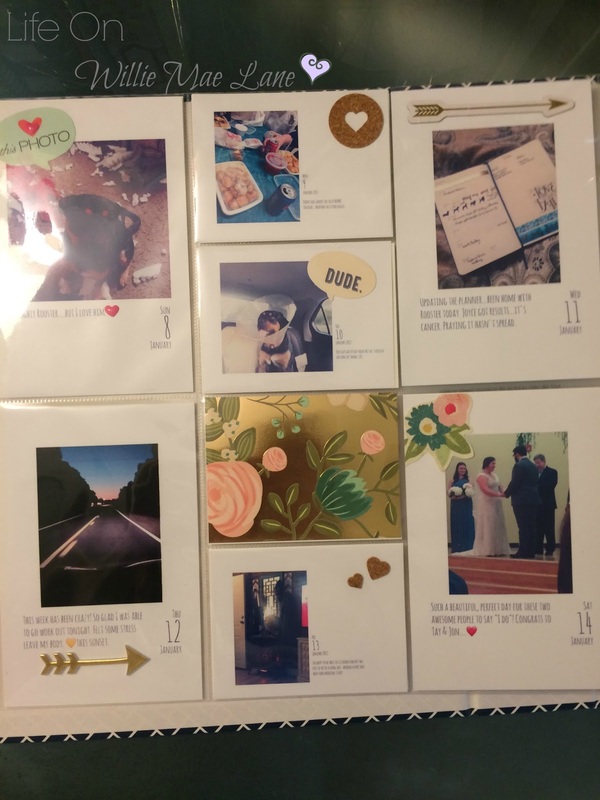 I included a photo of the vision board I created for my word this year. I have one of these enlarged hanging in my craft room, one taped inside my day planner, and another in my planner at work. Here's a screenshot of my Smile folder on my iPhone. I have all my photo related apps in this folder. The blue "C" is the Collect app. This is what I see when I open it. 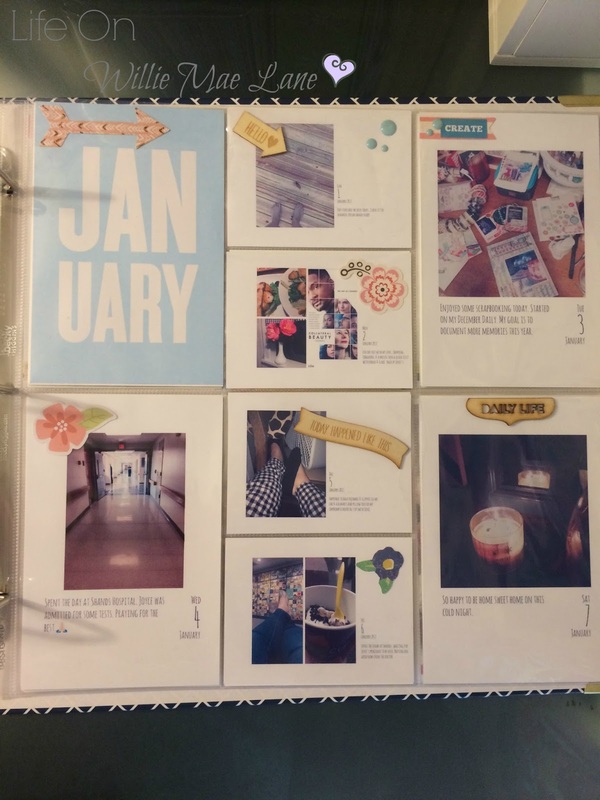 I just click on the date for that day and choose a photo from my phone, edit it, and then journal a little about my day. It limits you to so many characters, but I usually don't have a problem fitting everything I need to. Sometimes I have to get creative with my wording though. At the end of the month, I will download them in both landscape and portrait and then decide which format to print when I get my page protector out and ready. I am enjoying it so much. I did a December Daily album and it got me hooked. 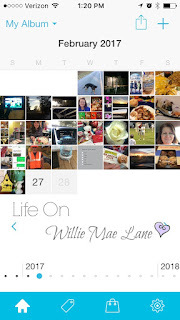 The Collect app makes it manageable for me and I look forward to choosing a photo or photos to use each day. I try to enjoy each day and the often simple events of my life. These ordinary moments are important to document as well as the big moments. Once again, it has been weeks since I put up a post. 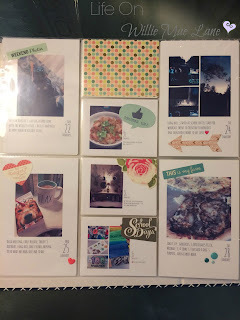 I keep trying to find time to fit in a weekly post but it just hasn't happened...yet! I plan to keep trying...lol! In my defense, life has been even busier than normal around here. Let's catch up a bit shall we? When I last posted, we were in the process of building our new porch. While it is not finished, we are able to use it now. I'll share more later in this post. Here in Florida, we have been having absolutely gorgeous weather. Temperatures have been averaging in the seventies, which is my favorite. It definitely feels like spring and I have been enjoying being outdoors. The azaleas think it's already spring too. They have been so pretty. I have been doing a little shopping. I purchased this quote picture at Hobby Lobby for my master bedroom redo which is next on the home improvement list. It will be a while still before we totally finish the porch and skirting around the porch and our home. I have been looking for porch furniture and love this set from Wal Mart. I have found several sets I love, but I don't love the price tag, so I am making do with what I have for now and am hoping to find a good sale or clearance at the end of summer if not before. I've been spending some time in my happy place each week. 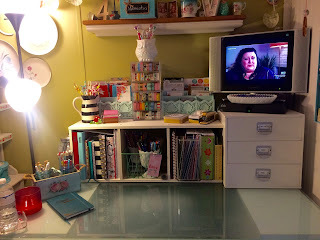 I cleaned off the desk top and rearranged a little. 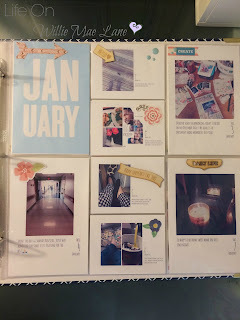 I also completed my Project Life scrapbook pages for January and will be starting February soon. I plan to share what I am doing in a blog post sometime soon. I've been eating healthier most of the time and continue to work out with my trainer 2-3 days a week. Sometimes life gets in the way, but I love working out and will not be giving it up. I have been going to a chiropractor every Friday for neck and back adjustments as well as some other issues. I am pleased with my progress so far. I have also been reading a LOT! I have a rekindled passion for reading. I always read a few books each year, but this year, I can't get enough. I especially enjoy sitting on the porch and reading. I feel that reading is good for my mental health...I enjoy it so much. I helped celebrate my beautiful friend, Heather's birthday. Many of you have prayed for her along with me. She is over 3 years now in her battle against cancer and while it has never went away totally, they have been able to do surgeries and chemo to keep it from progressing too fast. My friend Jeana made her beautiful cake. She's baked all of the cakes you have seen on my blog over the years. I celebrated Valentine's Day with the kinders and they lavished me with sweet gifts. :) Speaking of kindergarten, I have been staying at work late on my workout days and prepping for the next week which has been working out so well. I love walking in Monday morning and having everything ready to go! Now...let me share a few photos of the porch progress and fill you in on what we still plan to do. Here is a shot from the end. It is 10' X 32' and I LOVE it! We still have to build the steps and decide what kind of handrails we want. We will also be screening in the left side to keep bugs and other Florida creepie crawlies out as well as to keep the dogs from laying on the cushions of the furniture we plan to buy eventually. The screened in part will have furniture similar the the set I shared above, as well as a table and chairs. We are building really wide steps so I can put flower pots on the sides. We are eventually going to do a stain/paint combination but that will be later on. We will be hiding the block foundation with skirting which will go all around the porch and house. I plan to landscape a little after the skirting is complete. We are also hoping to lay sod this spring. So much to do! For now, I am using these two chairs that I used to have in the house but have been living in the shed for a while. I am also using a rug I already had as well as the little blue table which I have had for a few years. I want to decorate the ladder with flower pots and garden themed items soon. I hope to replace these chairs with rocking chairs eventually. We purchased the two Adirondack style chairs from Lowe's a few weeks ago just to have something to sit on before we finished roofing it. Eventually they will be replaced with a glider swing/love seat. This is the end that will be screened in in the future. 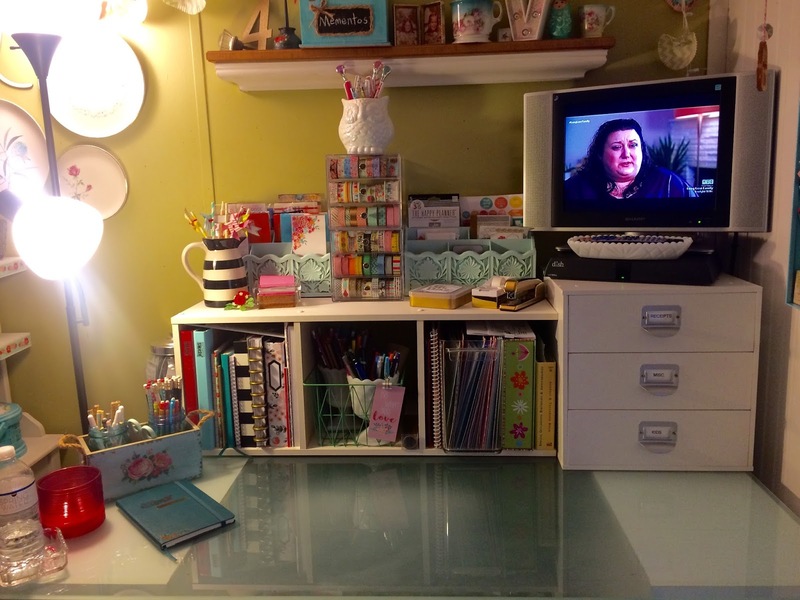 For now, I have my little ice cream parlor table and chairs I have had for a few years. Getting this our of my dining room opened it up quite a bit too. I just bought this beautiful birdhouse at Cracker Barrel yesterday. I plan to hang it as soon as I get a pretty hook. I'm not the only one who enjoys the new porch...Sadie and Rooster thinks it is all theirs. Sorry about the long post but I wanted to catch up with you all. I shared in my last post that my mother-in-law does indeed have cancer. She is currently going through radiation every weekday and chemo on Fridays. This is for 6 weeks. She is doing remarkably well so far but is beginning to tire more easily as well as having a sore (burned) throat from the radiation. She is in good spirits though. We spent the day with her and her boyfriend yesterday and had a beautiful day. Miranda is on her way for a visit with Bell as I type this and we are going to sit on the porch and have paninis and chips for lunch. Mama is coming to visit as well. So, I better get up and get busy! I so enjoyed catching up with you all and if you read to the end, thank you. Have a beautiful week my friends.